In recent weeks there has been a lot of discussion in Ghanaian media about the Plant Breeders Bill which was waiting to go through Parliament. Here at Trax we have also been thinking about the ways this Bill could impact the farmers we work with and our project activities. The Plant Breeders Bill was eventually suspended again on 11 November. This is not the first time the Bill has been suspended for review before being put to Parliament. The Bill is dated 2013 but we are now nearing the end of 2014 and it has again been suspended. The current suspension follows a lot of critique and objection, both nationally and internationally. If passed, the Plant Breeders Bill as it currently stands would protect the intellectual property rights of seed producers. Most formal seed producers are large, often international, companies – the Bill has been dubbed ‘The Monsanto Law’ in reflection of the protection it would provide large-scale seed producers such as Monsanto. In reality though, many farmers produce their own seed as well as buy additional seed stocks each year. The Plant Breeders Bill would limit farmers’ ability to produce their own seed from their yield and instead require them to purchase new seed from accredited sellers each season. Trax Ghana’s beneficiary farmers are rural smallholders, many of whom are living in extreme poverty. The requirement to buy protected seeds each year would increase the costs incurred by the farmer, thus reducing the capital they have available to spend on other essential items such as supplementary food, shelter, healthcare, and education. 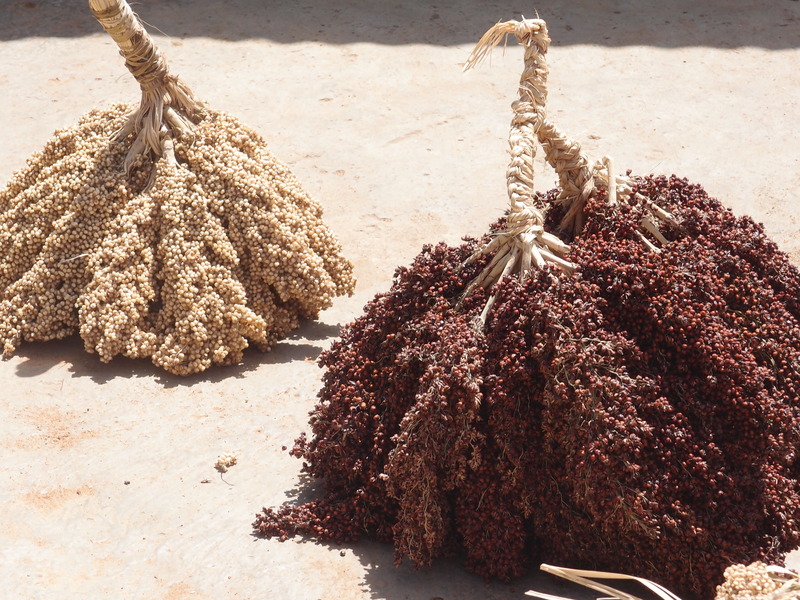 Sorghum being dried after harvest last month. The seeds can be stored for cultivating next year rather than used as a cereal food. An additional concern is that it would reduce the biodiversity of crop varieties because farmers would no longer be informally producing seeds. There is widespread discourse at the moment that suggests one way to increase resilience against climate change is by increasing crop diversity. Furthermore, crop diversity is traditionally a method used by farmers to limit the spread of pests and diseases. Reducing biodiversity within the crop system increases the risk of widespread crop damage or loss. If you are a smallholder farmer growing crops to feed your family this is a risk you would not be willing to take. The Plant Breeders Bill could enforce this increased risk should it be passed into law in its current form. One feature of Trax Ghana’s project activities is the loaning of groundnut and soya bean seeds to beneficiary women. They are loaned seeds one year and once they have harvested their crops they must pay back the same amount of seeds from their yield. These seeds can then be distributed to another woman. This activity is possible because seeds reproduce themselves. Should the Plant Breeders Bill be passed into law with the existing conditions, this feature of Trax’s project would no longer be possible in its current form. While Trax would be able to loan seeds to women, the seeds would need to be repurchased each year to be loaned to another woman because the seeds produced by the women would not be permitted to be used again. Thus it would no longer be a seed loan scheme because there would be no use in the women returning the seeds to Trax after harvest. Trax Ghana recognizes the debate regarding securing intellectual property rights for seed producers but our primary concern is ensuring poverty reduction and increased food security for farmers in Northern Ghana. Seeds are an essential element of this so to have the best chance of increasing food security farmers need to have cheap and easy access to seeds every season. This entry was posted in Agriculture, Media, News Update and tagged Ghana, intellectual property rights, Monsanto, New Alliance for Food Security and Nutrition, Plant Breeders Bill, seed loans, Seeds, smallholder farmers, the Monsanto Law. Bookmark the permalink. We promote the use of certified seeds very strongly on the show (here in Kenya, TZ & Ug) and try to persuade people away from keeping seeds from last year to plant. However, if seed companies cannot provide a reliable and secure income of seeds for sale, this can cause severe problems. Great thanks, will have a look!